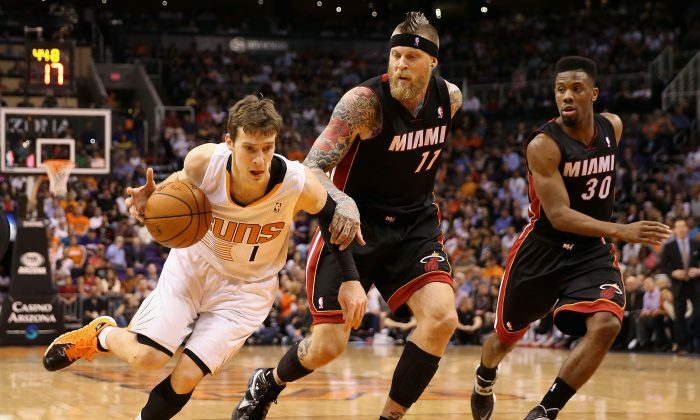 The Miami Heat have leapt back into the serious contender conversation after acquiring Goran Dragic on Thursday. The star guard was acquired by Miami on Thursday, with the Heat managing to give up very few key rotation players. Miami sent Danny Granger, Justin Hamilton, Norris Cole, and Shawne Williams out and received Goran and his younger brother Zoran Dragic from the Suns in a three-team deal that also involved the Pelicans. Granger has been injured most of these season, Hamilton has been a nonfactor for years, Cole has struggled despite being penciled in as the starter before the season, and Williams is good but certainly won’t be sorely missed. With Dragic, Dwyane Wade, Luol Deng, Chris Bosh, and Hassan Whiteside as their starting five, Miami is all but assured of a playoff position that looked unsure just days ago. Miami, at 22-30, currently has the eighth spot in the Eastern Conference, tied with the Charlotte Hornets. The Nets, Celtics, Pistons, and Pacers are all within two games. The trade deadline completely shifted the bottom of the playoff picture. The Hornets were unable to add anyone other than Mo Williams, while the Pacers weren’t able to snag Reggie Jackson. The Nets (acquiring Thaddeus Young for Kevin Garnett), Celtics (adding Isaiah Thomas for a draft pick) and Pistons (getting Jackson for D.J. Augustin) are definitely favored higher than Charlotte and Indiana for the last spot thanks to the roster upgrades. But it seems they may all be competing for one spot, with the Heat now considered by many a lock. Sure, Wade and Bosh have struggled with injuries. But they got time off over the All-Star break, and should be ready for the stretch run. And Dragic is much better than Jackson, Thomas, and Young, and a better point guard than Wade has had at his side for years. Dragic is an elite ball handler who is also crafty enough to rank second among guards in terms of finishing around the rim in half-court offense. He’s converting 64 percent of his shots. He’s also fourth in total transition points, according to Synergy Sports Tech. Dragic has regressed this season from last, but that’s mostly attributed to the addition of Thomas, another point guard, into the Suns already crowded backcourt. Without Thomas–and mostly without Eric Bledsoe–last season, Dragic averaged 20.3 points a game on 50 percent shooting. He also dished out 5.9 assists and recorded 1.4 steals. And he shot a crisp 40 percent from three-point range. And he had an impressive 27.4 assist ratio percentage. Other advanced stats show how Dragic thrives in this role. Without Bledsoe last season, with a usage rate of 25 percent, Dragic shot much better (62 percent versus 56 percent true shooting percentage), won more (65 percent win percentage versus 50 percent), and had a much higher WARP (9.1 versus 1.7), noted ESPN. The latter, wins above replacement player, highlights the importance of a player to his team versus the league average for his position. Dragic has still been doing great this season when he’s the lead ball handler on the floor, but that’s been rare with both Thomas and Bledsoe getting lots of playing time. In the short amount of time he’s been the lone point guard, with a similar usage percentage to last season without Bledsoe, his shooting has again spiked, as well as his win percentage and assists. As the new unquestioned lead ball handler for the Heat, Dragic should thrive like he did last season. That’s great news for the Heat and bad news for the upper echelon of the Eastern Conference, who were counting on the bottom two seeds being relatively easy to beat. Add Dragic to the Heat’s already fairly good starting lineup (when everyone’s healthy–in the mere 28 minutes that Wade, Bosh, and Whiteside have played with Deng and Mario Chalmers, the Heat are +17.7), and Miami has a good shot at pulling off an upset in the first round. The Heat will likely finish as the seventh seed, barring a collapse by the Bucks with their new players (Michael Carter Williams in for Brandon Knight, primarily). That means they’ll likely face the Toronto Raptors or Cleveland Cavaliers. Those teams probably weren’t scared by the idea of facing the Heat in the first round before. Now they are.